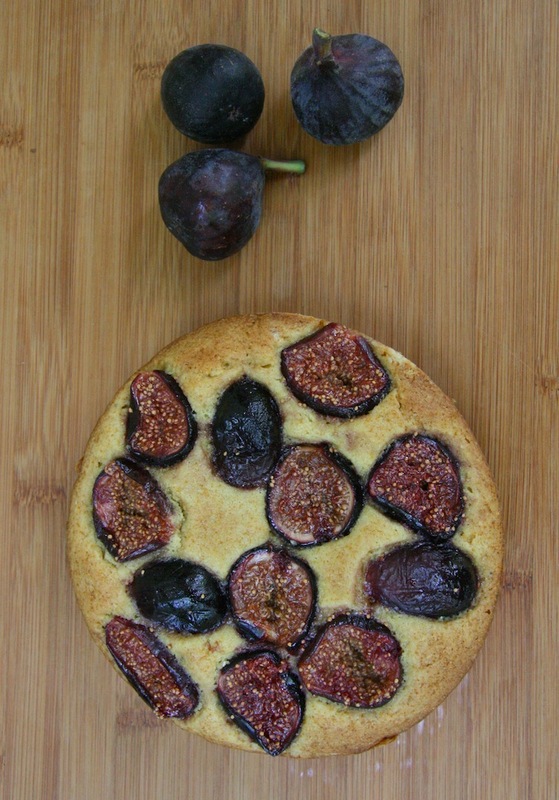 The Tuesdays With Dorie baking group is quite seasonal this week: our recipe is A Fig Cake For Fall. I knew this recipe would be coming up soon (because there are so few recipes left for TWD to bake) so when I saw some early figs in the produce section back in September, I made sure to buy them and bake up this cake. - Our hostess this week is Alvarosa of the blog Cookie Rookie, who is from Vienna, Austria, and who had never baked before joining Tuesdays With Dorie. You can find the fig cake recipe on her post, and you can read about how she found and joined the baking group (hint: it involves meeting Dorie herself in Paris). - The recipe calls for poaching the figs in ruby port. I had a bottle of tawny port but no ruby port. I consulted the internet for advice, and found this chowhound discussion. My conclusion after reading: use whatever type of port that you have. So I used the tawny port. Although the poached figs were delicious, this was not my favorite cake. The cornmeal was a little too prominent, and the ratio of cake to fig was too high for me. As I ate my slice of cake I found myself wishing for a denser, moister crumb, with more lemon flavor, and more figs. Overall, I prefer more intensity in a fruit dessert, but it was still fun to try this very seasonal dessert. I would agree with you, I love lots of fruit in my fruit cake. Probably a bitter cake pan would have resulted in a shallower cake and with more figs on top it would have been perfect. I love figs, with port they must be even better. What are you going to do when TWD will have no more recipes? Her book Paris Sweets has lots of great recipes. I used the finest cornmeal I could find and it's still very obvious. I didn't mind it but my husband is not a fan of cornmeal. Overall, I really liked this cake, as I liked the honey/port sauce. amazing. looks perfect in every way. Nancy, you said it better than I could. The cornmeal was overpowering to me and not enough figs for the amount of cake! we are in total agreement. But your cake is lovely as always. I was so bummed I couldn't find the figs to make this cake. I should have planned ahead like you did! Though that said, so far the reviews I've read haven't been overly enthusiastic so maybe I'm not too bummed I skipped it :) It's a gorgeous cake regardless! Your cake looks lovely, Nancy! I didn't have the right kind of port either and thought it was fine. It's funny, two months away from the end of TWD I didn't think I would be accumulating more pans. but I actually looked for a six-inch springform to make this cake in. I didn't find one (I only went to one store) and made the whole recipe, which was a bit more fig cake than I needed. sorry this cake was not super for you but it sure does look good! Not your favorite? Well, that's okay, it looks like it was probably someone's favorite. I love the photo of the figs...I always just want to eat them alone all by themselves and not put them in anything. That's why things like fig cake don't get made around here. Yes, this cake missed something. But I thought the drizzled syrup helped.